If done correctly the drenching process can be fitted into the normal milking routine with ease, and without any substantial increase in milking times. Drenching is used to balance the diet of dairy cows and to provide protection against metabolic and other illnesses. Products commonly administered include bloat preventatives, magnesium, zinc to support metabolic processes and trace elements including cobalt and selenium. Effective with any soluble or insoluble product. Economical - very little wastage. Reliable and accurate - each cow receives an accurate amount and no cow misses out. Easy to carry out in herringbones. The drenching process can add time to the milking routine. Difficult to carry out in rotary dairies. adding to supplementary feed in troughs or in the bail. How do I drench during milking? Wait until the cow lifts her head, then put the nozzle into the side of the cow’s mouth and releases the trigger. The milker may, but usually does not, need to control the cows’ movement by placing a hand over her muzzle. Drenching should take 3-4sec per cow. Finish applying the clusters to one side of the herringbone at the yard end and then walk from entry to exit drenching the milked cows as they go. This coiled drench line takes the spray nozzle back to the bail area entry end, ready to be picked up again for the next time this row is drenched. With a conventional milking routine, both milkers change clusters from exit end to yard end. Then one milker goes up to drench the cows from yard end to exit end. In contrast to the single operator herringbone, they do this on the side with the clusters on. The other milker remains in the pit replacing any cluster that falls during drenching, changing clusters on any slow-milking cows, completing the teat spraying, and releasing and replacing the milked row of cows. By the time that row is out and the new row is in position, the drencher will be back down in the pit ready to start changing clusters again. With this routine there is virtually no time added to the milking routine, the drencher using what would otherwise be almost ‘waste’ time. 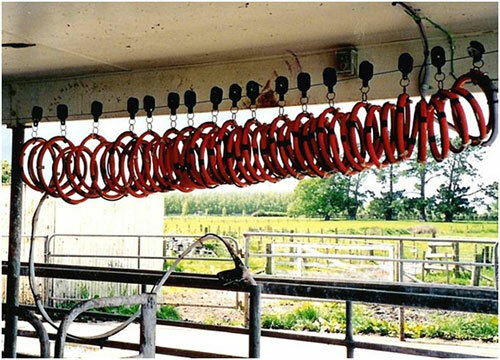 At the end of a row the drench gun and hose can be flicked back to the yard end again by a coiled spring hose or attached to ‘carriages’ hung on wires on both sides of the bail area and connected to each other by a long cord that returns each gun to its start position automatically. With larger rotaries the drencher usually stays up on a walkway in front of the cows throughout the milking, keeping well away from the entrance to avoid disrupting cow flow on the platform. The drench hose is suspended from the roof. What type of drenching systems are out there? A commonly used drenching system, which is commercially available, consists of a 200 litre drum fitted with a long-shafted centrifugal pump, located in a room adjacent to the bail area. The active ingredient (usually solid) is stored nearby, added to the drum with water and mixed, often continuously, during delivery using a bypass on the delivery pipeline to keep the mix uniform. Using a hooked nozzle is easier, even when cows are turning their heads away. To avoid the insoluble solids settling out if left, the mix can be moved continuously in a supply loop to and from the bail area distribution system and drawn off for cows in a measured dose as needed. A circulating pump, an air compressor and a metering head can be used to accurately measure the required dose. It allows bloat remedy to be kept separate and combined with a mineral mix at the metering head. Another simple manual system uses timing by the operator to decide the amount required. Delivery hoses must be cleaned after every milking.